Surprise the special people in your life with this thoughtful personalized gift. Perfect "Thinking of You" gift for a friend who needs a little "TLC." Also a great "Going Away" gift or "I Miss You" gift. 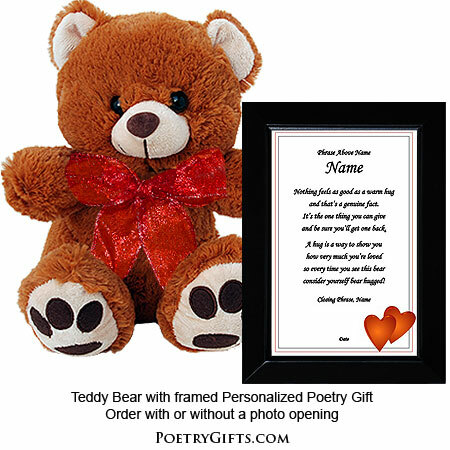 This personalized poem, photo frame, and plush bear is the perfect gift for so many occasions. The teddy bear measures 10" tall and the outside dimensions of the modern black frame are 5" x 7". 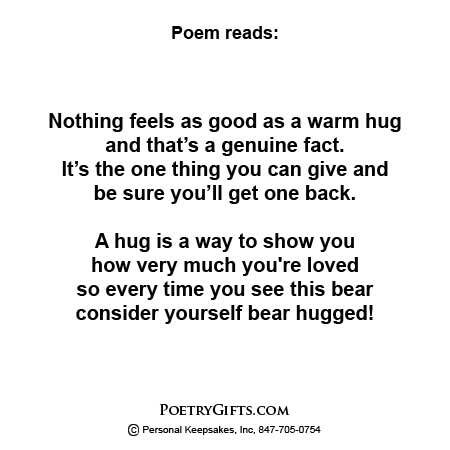 Whether you are married or in a relationship, you can send a hug to your sweetheart, family members and friends and just count how many hugs you get back! 3. Closing Phrase and Your Name (as seen after poem) - (Examples: I Love You More... Rachel; Always & Forever, Troy; Consider Yourself Hugged, Sean, Liam & Meghan; etc.)"